The social media and tech cabal is adamant in its claims that censorship isn’t happening on its platforms. But Matt Bracken from EnemiesForeignAndDomestic.com recently came out to say: prove it! During a recent episode of The Alex Jones Show, available , Bracken called to task the tech giants that have removed channels like InfoWars from their platforms. He says they need to put their money where their mouth is and provide actual evidence that they’re intentionally removing conservative content. “There must be truth in the algorithms; the algorithms should be published,” Bracken stated, referring to the programmed systems that decide what content shows up in Google’s search engine, for instance. As we previously reported, algorithmic censorship is taking place, regardless of what Google, Facebook, and the other would have us believe. 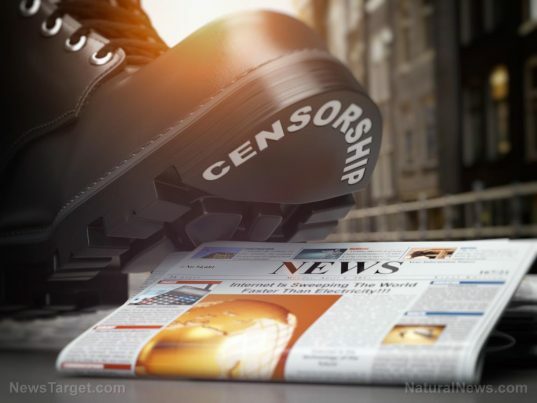 Robert Thompson, CEO of News Corp., recently warned about how the social media behemoths have “left us perched on the edge of the slippery slop of censorship,” which is concerning when some 67 percent of adults now get at least some of their news from social media. More needs to be done, he says, to mandate transparency and honesty, especially since the tech cabal is already long overdue for some serious antitrust intervention. With virtually every major tech platform promising to fight against “fake news,” which is really just anything these corporations don’t want people to know, it’s time for We the People to demand that these digital control freaks finally be held accountable for manipulating the free flow of information. Truth be told, if Google et al is telling the truth about their algorithms, then there’s no reason why these companies should be opposed to releasing them to the public for careful scrutiny. What do they really have to hide? Are social media “scores” already being assigned to users? China is already neck deep into social media censorship and control. The communist country is now actively assigning so-called “social scores” to citizens based on their internet and social media habits. People who abide by the government narrative are given high social scores, while those who buck trends, ask questions, and think for themselves are given low social scores. These scores affect people’s social “reach,” which ultimately determines the level of “voice” they’re given in terms of power and influence in society. For more censorship news, check out Censorship.news.